So you are another enthusiast angler and looking to buy best fish finder under 300 dollars. These fish finders come into the category of beginners’ fish finder. But the technologies offered are a huge boost for a starter. This is a list of fish finders, not fish catchers. The below best fish finders will only help you in finding fish under your vessel. By no means, it’s a guarantee that you will have tons of fish catches by the end of the day. To further explain, the fish finders give you the eyes to see what is under the water, where you should be fishing and where you should avoid wasting your time. In the range of $300, different features are offered. If you are just a beginner then it might be hard read to understand what each feature means and what is the significance of each part. To better understand the technologies covered in this list scroll to the bottom and read short briefs of each. If you are looking for best fish finder under 300 dollars then you are looking at a very different kind of fish finder. Deeper smart pro is the most portable fish finder in this list. It is a 6.5cm ball that you can attach to your fishing rod or equipment or simply place on the water with some thread connection. The working principle is very simple. You put smart pro in water it begins scanning and with its own inbuilt wifi, it starts transmitting data to your smartphone. Now here is the catch point you do not need internet connection rather you need to connect with smart sonar wifi connection. Simply download an app from Apple Store or Google Play Store and your device will be integrated with smart sonar. However, if smart sonar distance increases from your location then your phone might auto connect to your networking internet connection. To avoid this problem simply turn off your Mobile Data on your phone. Your screen size or screen pixel ratio depends on your smartphone. If you have a bigger device then it’s going to be an even better resolution. So deeper takes the responsibility of display out of question and puts it on the user end by further adding mobility. Deeper Smart Sonar is very light in weight and you can place it in your pockets such as the compact size and small weight. Smart Pro has revolutionized fishing by keeping your budget steady. It has won best fish finder award 2016 from CES USA, AFTA, Fish Alaska, Anglers Mail UK, PC Magazine Russia and also from China. Also, it works by cast-able Dual beam sonar operating at 290/90 kHz with cone angles of 15 and 55. In addition, it can scan till a depth of 260 feet and has an in-built temperature sensor. The Lithium Polymer battery works for 6 hours and takes a total of 2 hours to get fully charged. Smart sonar pro comes with an integrated GPS. But do not get carried away it is just a Bathymetric mapping facility. Bathymetric is the mapping of terrain submerged in water. So when you use the smart sonar pro in water it will make recordings of the bottom and will get stored in your smartphone. You can save, access and share the terrain and use it later. 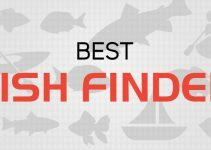 Under the reasonable budget, you get a 5-inch greyscale fish finder in this list of best fish finder under 300 dollars. Although the screen display is black and white but the 5-inch large display and high resolution make it worth a buy. The resolution for the screen is 320 x 480 pixel which is quoted ahead of 240 x 160-pixel minimum accepted pixel matrix resolution. The model supports Dual Beam frequency with 77/200 kHz frequencies. The transmitting power is 300 Watts and maximum peak to peak power is 2400 Watts. The maximum depth which can be scanned with this Dual Beam is 1500feet for freshwater and 600feet for salt water. Since salt water is denser than the fresh water hence it is difficult for the smaller frequency to achieve further depth in salty water. Therefore, saltwater depth is lower than fresh water for all depth finders. You can have split screen view of both scans on the screen. Ultrascroll which is a Garmin feature that displays fish scanned even at higher boat speeds. The fish symbol ID is also included in Garmin Echo 200 fishfinder it helps in identifying fish targets. Water temperature sensor is also part of this unit. The transducer is included in the box with its mounting bracket. There is also an additional mount for the fish finder as well. So, it is quite a good package considering what Garmin is providing within this price ranges. The only drawback is the non-colored screen. The 5-inch screen is a huge plus but sometimes grey scale gets tricky in understanding. 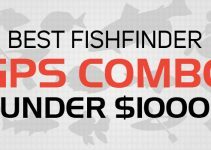 Another grey scale 4-inch model makes into this list of best fish finder under 300. The screen resolution is 320 x 240 which is just over the safe pixel matrix ration. You will have a good view but not an excellent view understanding the charts. Especially, when it is a black and white screen and lower resolution + 4-inch screen all these factors combined do not promise an excellent scan reading ability. In all these shortcomings Lowrance has included the backlight display along so you do not have trouble viewing screen in bright sunlight. It is a dual beam 83/200 kHz dual beam scanner. The model includes the TrackBack ability which will help you go through the history and look for what you have missed and can catch back. All this is done by moving the cursor back through the sonar display history. The transducer has a built-in temperature sensor. The maximum depth that you can explore with this unit is 1000 feet and with 2100 Watt peak to peak power. Now you might be thinking why this model is included in the list of best fish finder under 300. The answer is GPS, this model has an in-built GPS that really covers most of its shortcomings especially the screen. Its pre-loaded with a base map and is also compatible with Navionics Gold and Premium maps. In addition, Fishing Hotspots Pro maps also work with this model. But you would have to buy these additional maps and install them with the microSD card slot which is water resistive. At Tell Me Best we have tried to find the features fish detecting machines. Raymarine units are very affordable and offer a lot of features for a reasonable price which is why this Pro series fish finder makes to the list of best fish finder under 300 dollars. It is a 4.3-inch screen with LED color display and has a resolution of 480 x 272. The resolution and screen display are in perfect balance. The model offers two technologies in this compact device. You get CHIRP and Down vision in this under 300 dollar fish finder. Its an excellent choice and better than Lowrance Mark-4 in terms of technology and color display. The maximum depth which you can explore with down vision is 600Feet and 900feet for traditional CHIRP. You might have noticed that the Down Vision depth is higher than normal depth range. It is because the Down vision is of CHIRP version. Multiple bands of signals is sent to measure the depth hence there is more depth range. That is why it is called Dual CHIRP machine. This model also makes into our list of best fish finders under 500 dollars. Raymarine is one of the only few companies which offer CHIRP Down vision. It is a powerful addition and makes this device quite powerful. What’s icing on the cake is the GPS inclusion. Yes, that is correct Dragonfly-4 is a GPS combo fish finder. It is compatible with Navionics Gold and Platinum Maps, Hotmaps, SonarChart and C-MAP by Jeppesen. You can store 3000 waypoints divided into 1000 groups for classification. 15 tracks each with 10,000 points capacity. You can install the maps with the MicroSD slot. 5 inch 256 color display screen with highest pixel matrix resolution in this list 800 x 480 pixel. You might overlook the resolution factor but if you have bought a low-resolution fish finder in the past then like me you will be putting loads of emphasis on this part. 800 x 480 is a very high pixel ratio, to explain in simple words, if you come across a school of fish then with this resolution you will be able to identify them with precision. Even if there is a big potential catch hiding just above a tricky structure with color display and high resolution you will be able to discern the target. This is a CHIRP dual beam scanner but also supports conventional CHIRP but you would have to buy that transducer separately unlike Raymarine Dragonfly which comes with both CHIRP in the box. The dual beam CHIRP works on frequencies 75-95/175-255 kHz or an average simple ratio of 83/200Khz. The maximum depth measured with dual-beam CHIRP is 1500feet. The peak to peak power of CHIRP is 4000 watts and RMS Power output is 500 Watts. This is a GPS combo fish finder with built-in UniMap cartography you can work with. However, with MicroSD card slot you can add additional maps and save waypoints. GPS waypoints capacity is 2750, Routes are 47, and Track are 50 and Points capacity is 20000. The transducer has transom mounting and has inbuilt water temperature sensor. Switchfire ability is included in this model which helps in removing details from the screen like Fish IF, Freeze Alarm, Temperature Alarm, Digital Readouts and Selections. Unit comes with just 1 card slot. The 4.3 inch colored unit from Lowrance. The resolution is 480 x 272-pixel matrix. It is a 16-bit color TFT resolution. The LED backlighting is also present to easily view screen in bright sunlight. It comes with two scanning schemes DownScan imaging with frequencies of 455/800 kHz and with low medium and high CHIRP at 50Khz, 83Khz, and 200 kHz. The maximum power output is 500Watt RMS. It has the water temperature mounted on the transducer. Also, it only comes with the base mount you would have to buy the dash mount. In addition, it comes with minimum or maximum depth alarm. This is considered to be a standard depth finder feature these days. You can mount the transducer on the trolling motor. It comes with built-in GPS map and you can utilize them for use. It has the base map already loaded which has around 3000 US lakes map. However, it’s been complained that the maps are not very detailed and only help you tell where you are located in the lake. Stores a maximum of 3000 waypoints. You can drop these waypoints to save good fishing spots or mark them towards your journey. You can start a maximum of 100 routes and in each route drop a maximum of 100 waypoints. Also, you can place 100 plots with 10,000 points. Following technologies are covered in this list. See what suits your style the best and what you think would be a great addition to your fishing arsenal. It is worth noting that if you already own a fish finder then you should look for a fish finder that has more technologies then you currently have. Do not look to add technologies of two fish finders. Like if your old one has Dual Beam and you have decided to buy CHIRP and plan to use both together on fishing then it is probably not the best idea. Always keep portability in mind. Down scan throws little slices of sonar under your vessel and as you move forward it forms a triangular cone under your boat. The data is received back after reflecting back from water objects and digital image processing is done by your fish finder. The fish finder compiles the data received and present on the screen in the form on an image. Down scan is a good technology but is certainly not the most sophisticated technology these days. As it has depth exploiting limitations. Dual beam covers the shortcomings of down can and present a big picture like that of football field onto your fish finder screen. It sends two beams of thin sound waves in the water. One is of higher while the other is of lower frequency. The higher frequency can scan shallow water depth while the lower frequency can go deeper and measures depth up to 1500 feet. But here is the shortcoming as the water depth increases the power loss of low-frequency sound waves increases. Therefore, the echoes received lose more energy on their way back. In the end, you do actually get whats in the depth but unfortunately, it can be a blurry result. CHIRP Dual Beam has the same working scheme as that of a conventional dual beam. But it differs in the aspect that it sends a band of different frequencies targeted for different depths. The shortcomings of a conventional dual beam are covered by CHIRP Dual Beam and you get a better result on your screen. Traditional CHIRP sends a band of low band, mid band, and high band frequencies into the water. Each is meant to cover a different region of the water and display results on the screen. A device which includes CHIRP has display results which are easier to use. If you are starter angler then you will find it easier to read CHIRP digitally processed image then an image from Dual beam result. So if you have managed to read the list of best fish finder under 300 and have read the technology section as well then you must have a picture in mind of what you need. All technologies cannot be gathered in a fish finder under this budget. Especially the best 360 imaging which tells what’s ahead around and behind of the boat without even moving. If you have lack of space on your kayak, boat or vessel then you need a portable fish finder. 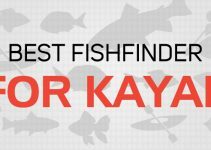 This is not brainer the most portable fish finder in this list is Deeper Smart Pro but once again its only dual beam and will have connectivity issues. The big plus is you can view results on your smartphone screens which are bigger than 5 inches these days. That’s bigger than all the screen sizes mentioned in this list. But if you read more closely Humminbird 410210-1 HELIX 5 then it is CHIRP and Down Vision. In addition, you also get a bonus GPS added within the same value. It has a screen size of 5 inches which is among largest on this list. But the drawback is it only comes up with UniMap cartography and you would have to buy the Navionics Gold or Platinum Maps. Thanks for doing an immense effort in compiling this list, saved me a ton of time. I am impressed with the success of deeper smart sonar and it matches my style. Deeper is a great fish finder to begin the journey. this on my Facebook. Thanks again for a great article!